Marcos 'Monster' Jaimes-Radilla is wanted in Washington County on multiple charges, including crashing a stolen truck on Saturday. 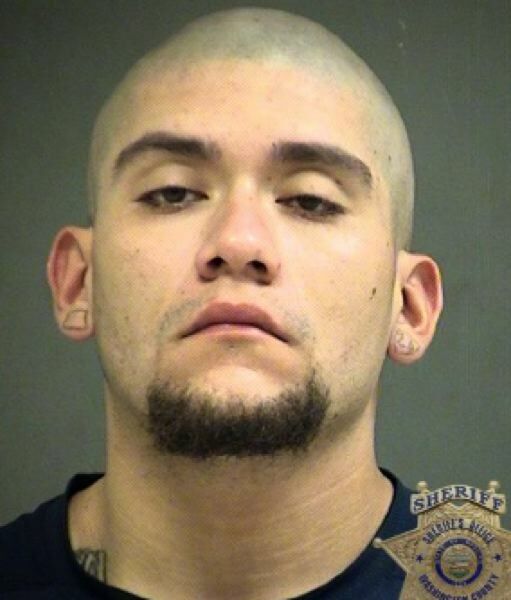 Washngton County Sheriff's Office deputies are searching for a felony suspect nicknamed "Monster" who allegedly fled near the Bethany area on Saturday night in a stolen vehicle after crashing another reported stolen vehicle in the same area. Deputies actively searched the area near Northwest Laidlaw Road and North Road for Marcos "Monster" Jaimes-Radilla, 25, the location where he reportedly crashed a black 1997 Ford F-150 that was reported stolen out of a different county, KOIN 6 News learned. Residents say authorities told them to lock their doors and stay inside while deputies searched for Jaimes-Radilla. He is 5-foot-11, 210 pounds with brown eyes and a shaved head. He also has tattoos on both earlobes. Later on, after a search in the area yielded no results, deputies said a black 2013 Ford Expedition was also stolen from the area, less than a mile from the crash scene. Deputies pursued the stolen Expedition eastbound on Highway 26 — as spotted by KOIN 6 News on ODOT cameras — but ended their search a short time after due to safety concerns. The stolen vehicle has an Oregon license plate 211GJQ. On Wednesday, the WCSO sent out a press release asking for tips in a search for Jaimes-Radilla. It said he is wanted for failing to appear in court on theft and burglary charges. It also said he was a person of interest in a car theft case and an attempt to elude case. KOIN 6 News is a news partner of the Pamplin Media Group.